Karen Mueller is one of the top autoharp and mountain dulcimer players performing today and a bit of a Sore Fingers favourite! She holds the “female record” for the most US tutor appearances at Kingham Hill School and we will be very pleased to welcome her smiling face again. Her exciting and innovative performing style, featuring Appalachian, Celtic and contemporary music, has been applauded by critics and audiences from LA to Boston. Bluegrass Unlimited magazine has said "Karen Mueller's touch, timing and taste make her a true virtuoso. Her talent and clarity...deserve a wide audience." Karen is an experienced teacher in a wide range of settings: private lessons, workshops at camps and festivals, school residencies, and school general music classes. Coming from a family where both parents were teachers, Karen has always felt a natural affinity for teaching. 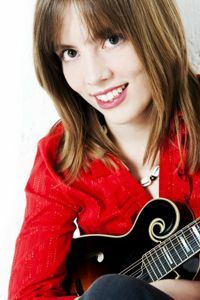 She first began by giving private guitar lessons at age 15, which quickly developed into teaching at a local music store throughout high school. Karen has taught private lessons in the Twin Cities since 1989, and currently teaches at Homestead Pickin' Parlor in Richfield, and at Chanson Voice and Music Academy in St. Paul. 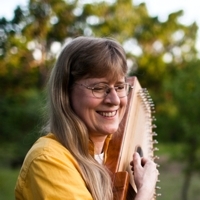 Karen's school work includes both special residencies in topics such as songwriting and dulcimer building, and general music classes for elementary students. Karen has studied the Orff approach to music education, which emphasizes movement, rhythm, singing, and playing instruments. She has taught ongoing classes with ages preschool through junior high in public and private schools since 1998. Greg Garrison has been knocking on the Sore Fingers door for a couple of years and it’s only scheduling problems that have prevented his attendance, His track record as a bass player is undisputed. Just read on and let your mouth water, it’s going to be a great bass class! 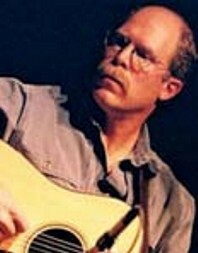 As an acoustic and electric bass player, Dr. Greg Garrison has made an impact in the bluegrass, Americana and jazz worlds through his work with artists such as Lyle Lovett, Bill Frisell, Chris Thile, Punch Brothers, Leftover Salmon, Jackson Browne, Don Byron, Bryan Sutton, Dave Douglas, John Scofield, Jerry Douglas, Sam Bush, Ron Miles, Del McCoury, Helen Sung, Art Lande, Stuart Duncan, and Vassar Clements. Garrison has been also featured as a member of the house bands for NPR’s nationally syndicated programs “A Prairie Home Companion” and “E-Town”. In addition, he has ecorded two albums as a leader, 2011’s Low Lonesome and the soon to be released Sycamore. 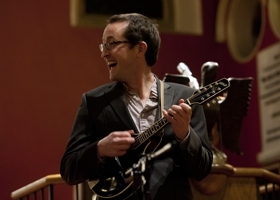 During his tenure as a founding member of the chamber-bluegrass quintet Punch Brothers, Garrison recorded two albums (Chris Thile’s How to Grow a Woman From the Ground and the Punch Brothers critically acclaimed debut Punch), garnered two Grammy nominations, toured internationally (including performances at Carnegie Hall, the Grand Ole Opry and The Tonight Show with Jay Leno), and was featured in Bass Player Magazine. His bass work can also be heard on bluegrass guitar legend Bryan Sutton’s Grammy nominated Into My Own, Stone/Blossom by trumpet luminary Ron Miles, and the Juno nominated albums The Lomax Project and Room of Wonders from banjoist/composer Jayme Stone. Greg has also been a member of the legendary Colorado bluegrass-rock band Leftover Salmon since 2000, recording seven albums with the band (Live, O Cracker, Where Art Thou, Leftover Salmon, Aquatic Hitchhiker, High Country, 25, Something Higher), producing two (25 and the upcoming Live from the Living Room) and headlining at high profile venues and festivals throughout North America such as Red Rocks, the Ryman Auditorium, Telluride Bluegrass, the Vancouver Folk Festival, and Bonnaroo. Chicago born and bred, Greg has been playing bluegrass banjo since the early 1970s and formed The Special Consensus in 1975. 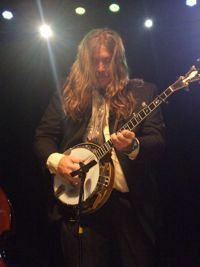 He has composed many banjo instrumentals and released three albums featuring his unique style: Lone Star (1980) with guests Jethro Burns and Byron Berline, Blue Skies (1992) with fellow Chicagoan Don Stiernberg, and Night Skies (1998) with Don and guests Sam Bush, Glen Duncan and Tom Boyd. He has appeared on all of The Special Consensus recordings, on numerous recordings by other artists, and on many national television and radio commercials as the banjo player of choice on Chicago's busy jingle music scene. Greg has also recorded with the ChowDogs (Slavek Hanzlik, Dallas Wayne, and Ollie O'Shea) and periodically tours European countries with that band. In addition to conducting workshops at festivals, teaching at the Old Town School of Folk Music in Chicago and teaching banjo at music camps, Greg has released four instructional videos/DVDs. 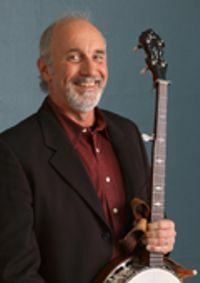 He served as Vice Chairperson of the Nashville-based International Bluegrass Music Association (IBMA) Board of Directors for several years and was elected President/Board Chair of that organization in 2006. Greg and his fantastic band is well known to British Audiences as he's been touring here regularly for over twenty years. He's a frequent visitor to Kingham Hill School and S.F.Week. If you need to brush up your banjo chops, this is your man! Music has always played a central role in Jeff Scroggins' life. He grew up in rural Oklahoma listening to his grandfather and friends playing old time country music. At age twelve, Jeff got his first guitar and through his teens, he played electric guitar in garage bands. Jeff picked up a second hand banjo in a garage sale and soon became obsessed with the banjo! He then traded his Gibson Les Paul electric guitar for a better Banjo. Jeff spent the 1980s learning all he could about his new love and honing his craft. He was fortunate to have the opportunity to learn from banjo legend Alan Munde and later after relocating to Texas, from James McKinney. During that time Jeff won numerous banjo contests including the prestigious National Bluegrass Banjo Championship in Winfield, Kansas in September 1989. 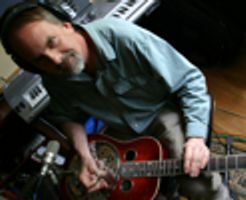 A year or so later Jeff became a founding member of the Andy Owens Project joining Sam Bush, Jerry Douglas, Mark Schatz, David Grier, Stuart Duncan, Alan O’Bryant, Terry Eldridge and Margaret Bailey to record a critically acclaimed CD “Kerosene Circuit", which was produced by Grammy winner Bil VornDick. The band toured extensively throughout the 1990s reaching far flung paces such as Russia and Japan. It is whilst living in Texas that Jeff was inducted into the Texas Tornadoes, an elite music society who includes music legends Stevie Ray Vaughn, Johnny Winter and Billy Gibbons (ZZ Top) amongst its membership. Jeff’s turned his focus on his family and performed with regional bands one of the more notable being the Wichita based Big Twang. In 2008 Jeff recorded his first CD, “Five Strings, Four Corners," which featured his 13 year son Tristan on mandolin. Later, Jeff and Tristan relocated to Colorado and in 2011 they formed Jeff Scroggins and Colorado, well known to US and UK audiences having already toured extensively. 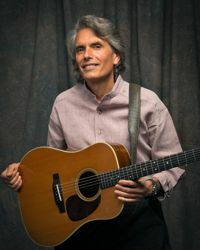 Jeff is an internationally known performer and teacher; he has taught at bluegrass music camps in the US and abroad; including Steve Kaufman Acoustic “Kamp”. He has also performed and taught at the Rainforest World Music Festival in Kuching, Sarawak, Malaysia on the island of Borneo. 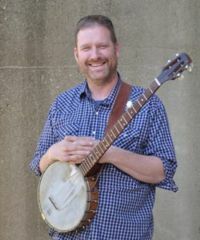 The band’s recent tour of the UK raised Jeff’s profile here and the Sore Fingers radar picked up the signal and decided to invite him to come along and share some of his banjo secrets. Our good friend Dobro expert (and past tutor) Martin Froud from Bristol pointed us in Greg Booth’s direction. One view of a you-tube video was enough to convince us that this was one Dobro player we needed to invite into the Sore Fingers Resophonic fraternity. Greg Booth's path to the dobro was a winding road that started with the banjo and lessons from banjo legend Bill Emerson. After a few years Greg's ambition turned to the pedal steel guitar and the last frontier, Alaska. A thriving music scene during the oil boom of the 70's and 80's gave him the chance to play as much as 7 nights a week and 7 hours a night for many years. That much time playing diverse music forged a style that is uniquely his own. When Greg finally picked up the dobro he hit the ground running, winning the RockyGrass dobro competition after playing the instrument just one year. Interest in Greg's dobro playing took off with his YouTube channel of thirty plus Dobro videos. Viewed about 1600 times daily it surpassed 2 million views in the fall of 2015. Greg has taught at many music camps in the US and abroad and records and tours with the California based Kathy Kallick Band. Some things run in the family and if we remind ourselves of sister Tatiana’s visit to Sore Fingers Week to teach Old Time Fiddle last year is anything to go by, Bluegrass fiddlers are in for an exceptional treat. UK fans are most likely to have seen Alex with Grammy-nominated singer/multi-instrumentalist, Sarah Jarosz, appearing on her three critically acclaimed albums. 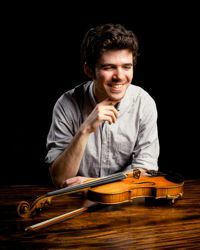 Throughout his career, Alex has received countless honors including the Daniel Pearl Memorial Violin from Mark O’Connor’s Strings Conference, and the Alternative Styles Award from the American Strings Teachers Association (ASTA). He is the youngest ever (age 15) to win the Grand Champion division at the National Oldtime Fiddlers' Contest in Weiser, Idaho, and won the 2009 Grand Masters Fiddle Championship in Nashville. At the 2010 Monterey Jazz Festival, Alex was awarded the Jimmy Lyons Scholarship, a full tuition scholarship to the Berklee College of Music. In pursuit of his passion for jazz and improvisational music, Alex completed the prestigious Berklee Global Jazz Institute at the Berklee College of Music in Boston. Under the artistic direction of world-renowned pianist Danilo Perez (Wayne Shorter Quartet), the program allowed Alex to work one-on-one with a select group of faculty, including Perez, Joe Lovano, and John Patitucci. While studying at Berklee, Alex toured with Danilo Perez, and recorded on Perez’s album, Panama 500 (Mack Avenue Records, 2014). The all-star lineup on the recording includes jazz icons John Patitucci, Brian Blade, Ben Street, Adam Cruz and others. Recently, Alex recorded and toured with longtime friends and musical collaborators Dominick Leslie, Nathaniel Smith and Samson Grisman. Their EP The Brotet, was released in June 2014 and features all original music by the band. Currently living in Brooklyn, NY, Alex performs regularly with a range of artists including Michael Daves, Roy Williams, Grant Gordy, Eddie Barbash, and Jacob Jolliff. An opportunity for Sore Fingers fiddlers to meet and learn with possibly one of the most promising musicians of the 21st century. It's funny how sometimes when you have developed a great passion, and looking back on how it all started, the beginning was a small insignificant event. Not a great revelation that knocks you off your feet, but a small, quiet occurrence, maybe even a slow process that brings you to the thing that you feel most strongly about - the thing you love to do the most. Such is the case with the music and John Lowell. The small, insignificant event was sneaking into his sister's room and picking up her guitar that was lying on the bed. The journey began at that point and continues to this day. What started as a small seed has grown into something that has consumed his life in many ways. The musical road has wound many places, from Colorado to Montana via Arizona, to Shetland, England and Canada, and all over the North American continent. The road isn't paved, so the occasional bump is to be expected, but the smooth stretches are frequent and long. There have been many late nights. There have been some absolutely amazing musical experiences, both as a spectator and a participant. The notes have gone into the air and vanished, leaving only an intense memory of what just happened. Well that’s John’s appreciation of his career as a musician to date and he can expect many more of those experiences to come his way. Almost part of the woodwork at Kingham, John is our Male US Tutor record holder for the most appearances, we’ve lost count. Most likely because people get so well in his classes. John has played in several nationally recognized bands and has travelled to England and Canada to teach guitar at music camps. John has received critical acclaim for his singing, song-writing and guitar playing. Several bands have recorded John’s songs which is credit to the man’s song-writing skills. So, we can look forward to some of that Montana guitar picking again. Welcome back John…. 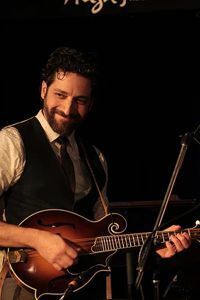 Brooklyn-based guitarist Grant has been a major voice on the American "acoustic music" scene, and one of the most highly regarded young instrumentalists of his generation. Having held the guitar chair in the legendary David Grisman Quintet for many years, he's also worked alongside such musical luminaries as Edgar Meyer, Steve Martin, Tony Trischka and Darol Anger. Grant has performed all over North America and Europe, everywhere from Carnegie Hall to Montreal Jazz Festival; Jazz at Lincoln Center to Bonnaroo. Not sure where to take your guitar playing next? Grant’s your man. He’ll show you how to play Cherokee Shuffle with a whole new set of chords that sound gorgeous. This course will be like stepping into acoustic guitar paradise! Roots music isn't made in a vacuum. It's the creation of a community, of a circle of friends, of a teacher and a student. It’s something to be passed back and forth to be treasured. As an acclaimed master of American roots music, mandolinist and songwriter Joe K. Walsh knows this better than most. 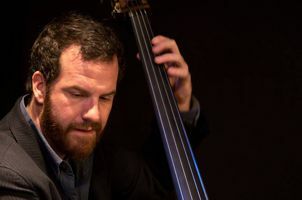 He’s toured with countless artists, collaborated with other master musicians like Darol anger and the Gibson Brothers, founded progressive stringband Joy Kills sorrow in the early 2000s, and is currently on faculty at the prestigious Berklee College of Music. His new album, Borderland, is an exercise in subtlety and careful creation. Turning through songs he wrote, or setting the words of Yeats to music, and picking out instrumental tunes of his own creation, Walsh plays and sings with the kind of ease that comes from years of practice and creation. The touch of sawdust in his vocals, or the buzz of the mandolin strings may hint at the deep rural roots of this music, but what he’s creating now is a new kind of tradition. His first inspiration came as a teenager when he heard David Grisman, and then again when first hearing Del McCoury. The music he heard at that young age opened a window to new harmonic possibilities, and started Walsh exploring how to create new American roots music. What’s surprising then is that his new album is no act of wild fusion. Instead, it’s a joyful exploration of just why he loves this old music so much in the first place. With mastery comes restraint. With nothing left to prove, Walsh has dived deeper into the tradition, seeking to craft new music from old roots. Borderland brings together Joe's frequent collaborators like seminal old-time fiddler Bruce Molsky, innovative bluegrass guitarist Courtney Hartman (of Della Mae), in-demand fiddler Brittany Haas (of Dave Rawlings Machine), blazing bluegrass banjo player Gabe Hirshfeld (of The Lonely Heartstring Band), and eclectic bassist Karl Doty. In creating the album, he pulled together these close friends for a series of acoustic adventures through original and traditional songs and tunes, reveling not in the kind of flashy showmanship one might associate with Walsh’s bluegrass roots, but in a sense of great camaraderie and deliberate craft. You can hear this on “Never More Will Roam,” as each instrument circles the other in easy counterpoint while Walsh’s voice floats above, a keening edge to his vocals. Or in “Innisfree,” as Walsh cleverly sets a famed poem from William Butler Yeats in a verdant Appalachian setting. Of all the tracks, “Red Skies” hews closest to Walsh’s bluegrass roots, but even here he’s playing with the form, subverting the idiom just a little bit. Borderland is the kind of album that’s constantly striving to move forward, to find new paths through the thickets of our shared heritage. Sore Fingers Summer Schools will add another lifetime achievement when Joe was part of the world’s “most expensive Square Dance band” to play for one of jackie Kempton’s impromptu late night dances at Kingham Hill School! Good to have you back Joe. Andrew last came over in 2008, far too long ago really. So, here he is and it’s a warm welcome back from Sore Fingers. Mandolinist Andrew Collins finds himself – through no actual fault of his own – at the centre of Canada’s burgeoning acoustic/roots music scene. He didn’t invent it – but he's certainly been a contributor, having co-founded seriously noteworthy Canadian bands like the Creaking Tree String Quartet, the Foggy Hogtown Boys and, more recently, his namesake Trio. That’s not to mention the fact that this prolific, robust performer – comfortable on mandolin, fiddle, guitar, mandola and mandocello – composes, produces, arranges, writes and teaches across multiple genres, including a popular collision of folk, jazz, bluegrass, celtic, and classical. As Collins gathers up innumerable JUNO nominations (5) and Canadian Folk Music Awards (7) won by his various ensembles, he’s zeroing in on the work he does with Trio-mates: fellow string guru Mike Mezzatesta, whose versatility shines through on guitar, mandolin, fiddle and mandola, and in-the-pocket James McEleney holding it down on the bass, mandocello and vocals. Showcasing a dizzying number of styles and instruments on stage, Collins and Co. appear to live by the old adage, “idle hands are the devil’s workshop”, likely keeping them just ahead of his grasp. Bending and blending genres, these musical shape shifters land somewhere between the re-imagined worlds of Béla Fleck and Newgrass invader, David Grisman. They just released a new double album, grafting 11 vocal cuts (tongues) to 11 instrumentals (grooves) to create a seamless finish with their cleverly monikered double album, Tongue & Groove. Each cut is milled to perfection and represents a back-to-basics visitation on what the band does best -- spontaneity of the stage and rapid-fire, improvisational exchanges. Andrew is no stranger to teaching having taught mandolin at lots of camps across the US and understands the needs of students of all abilities. His appearance her in 2008 was a total success and it has really been an oversight to not call upon his services sooner. We’re pretty proud to get Travis Stuart back at Sore Fingers Week. This man is fun as well as being a great teacher of Old Time Music. He came with Trevor back in 2007, a long time ago. Time we had him back, prepare for good times. Travis Stuart began playing the banjo as a young teen in Haywood County, North Carolina. He is a respected banjo player and multi-instrumentalist known for his rich style and solid accompaniment. Travis has toured the U.S. and internationally with The Stuart Brothers , Dirk Powell Band, Riley Baugus, The Reeltime Travelers, Martha Scanlan and step dancer Ira Bernstein. Travis learned from old-time masters such Red Wilson, the Smathers Family, Snuffy Jenkins, and Byard Ray. He is dedicated to performing and teaching old-time music. 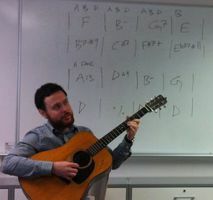 A respected teacher, Travis has taught at music camps around the country and abroad. For the last 13 years he has led the JAM Junior Appalachian Musicians program in Haywood County, North Carolina. Travis has recordings with The Stuart Brothers and has performed on many recordings and films. 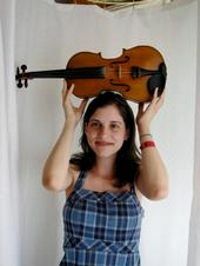 Here’s another fine player who has the ability to raise eyebrows and send ears pricking up when her fiddle bow connects with the strings, absolutely beautiful tone… Stephanie came across in 2010 to teach Old Time Fiddle at Sore Fingers Week. It was good experience for her - she loved it - and it was a brilliant experience for those who attended her class too. Stephanie comes from that young crop of Old Time and Bluegrass players from the East Coast of the US who are so influential on the American music scene these days. Stephanie hails from Chicago, Illinois. She was first exposed to old time music through her father, a fiddler and music enthusiast. At nine years old, Stephanie picked up a fiddle and played a nearly recognizable, albeit scratchy, version of "Johnny Don't Get Drunk”. She proceeded to immerse herself in Appalachian and Midwestern styles of old-time fiddling. She was mentored by local Chicago area fiddlers and travelled the country to attend music camps, festivals, and contests. She graduated in 2008 from Duke University, earning a degree in American Studies. While at Duke, Stephanie honed her passion for audio documentary production. Combining her love for music and radio, she produced a short documentary about venerated Kentucky fiddler, Clyde Davenport. In 2008 and 2009, Stephanie played fiddle in Triad Stage's "A Beautiful Star: An Appalachian Nativity", a highly acclaimed musical in North Carolina. Stephanie has performed and taught at festivals, workshops, and dances throughout the United States and Ireland and remains a regular finalist in the renowned fiddle contest at the Appalachian String Band Festival in Clifftop, West Virginia. Her fiddling was recently featured on banjoist Adam Hurt’s celebrated recording, “Perspective”. In 2009, Stephanie joined Uncle Earl, an internationally touring all-girl string band signed to Rounder Records. She currently resides in Brooklyn, NY. This will be Keith’s third visit to Sore Fingers and he is back because he is one of the best vocal tutors we have had teach at S.F.Week. His command of harmonies is nothing short astonishing and he will take the singers class to places they have just never thought of going! We are very pleased to welcome the "Bath Bluegrass School" to run the beginners/lower intermediate classes this year. Neither of the three tutors will need much of an introduction as they are all over the British Bluegrass and Folk scenes. All are talented musicians on a whole range of instruments and no strangers to Sore Fingers Week, when they are not teaching, you will find them on the staff! The beginners /lower intermediate classes could not be in better hands! These three highly experienced tutors (see below) who have jointly have devised an integrated programme to get you started on your playing careers. The programme includes both individual tuition on your specific instrument and group sessions where you will learn to understand how to play in groups and sessions. These classes are aimed at students who have little musical experience and have only been playing for a short time, those who have had a long break from music (perhaps you learned a stringed instrument as a child but are now returning to music as an adult) or who have been learning for a few years but struggle with confidence and making the next step in your playing. Over the course of the week, you will learn the right techniques avoiding those bad habits that can impede your playing if not tackled early on, boost your confidence in playing and learn to play with other as well as working on your listening skills, learning by ear and getting a string grounding in music theory. Generally, our beginners feel comfortable learning in a group and build the confidence to take private one to one lessons or join a main class within a couple of years. Charlotte Carrivick is an experienced teacher and internationally reknowned musician, touring with The Carrivick Sisters, Cardboard Fox, Midnight Skyracer and duo partner Kieran Towers. She started out teaching herself classical guitar as a child, becoming interested in bluegrass in her early teens. She is among the top bluegrass mandolin and guitar players in the country Charlotte has been teaching mandolin and guitar for a number of years both privately and as a workshop leader. Laura Carrivick is an award winning and highly regarded fiddle and dobro player, and is passionate about teaching her instruments, particularly in the early stages where people make the biggest leaps. She is a professional musician touring full time all over the UK and abroad with The Carrivick Sisters, Cardboard Fox and Midnight Skyracer. She also does extensive work as a recording session musician. 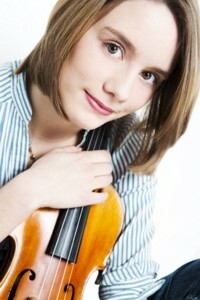 Laura has a grounding in classical violin but became interested in bluegrass at an early age. As well as teaching privately from home, she has taught workshops at schools and festivals all over the country. John currently teaches and performs full time since gaining distinction in his Masters Degree in Classical Guitar Performance from The University of Southampton. John has many years of experience as a workshop leader and in teaching one-to-one lessons to all ages. 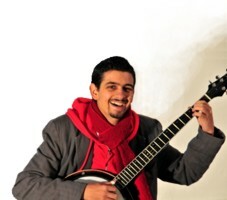 John currently performs with a number of bands, primarily Thunderbridge Bluegrass Band (banjo) and Cardboard Fox (bass). John is not only a brilliant musician, but also an excellent technician, something which he aims to pass onto his students.